Copy this page for each student (white paper). Color the back side of this paper different colors – so no white shows. Open it up and turn it over… It’s the Chinese character for “Spring”! Glue it on another piece of construction paper (optional). Super easy and totally cute. Enjoy! 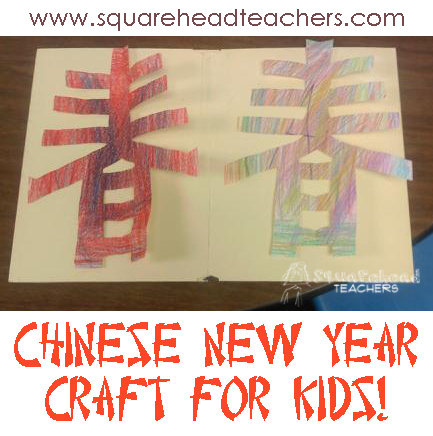 This entry was posted in Art/Crafts, ESL, Multicultural, Accommodations, Holidays/Seasons, Social Studies and tagged Children, Chinese, Chinese New Year, culture, Education, Elementary School, Homeschool, January, Kids, languages, Social Studies, spring, Teacher Resources, Teachers, Teaching by Squarehead Teachers. Bookmark the permalink.